The former Shiite Mufti of Tyre (Lebanon) Sayyed Ali al-Amin gave a lecture last night at the Ramadan majlis of Sheikh Mohammed bin Zayed, Crown Prince of Abu Dhabi. The theme of his talk, unsurprisingly, was about the need for religious leaders to stay out of positions of political power in Muslim countries. 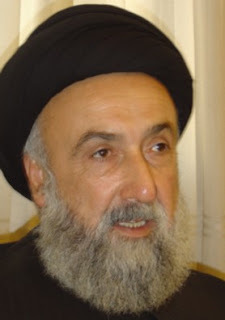 Sheikh Amin has been pressing home this point for many years now, so it is not surprising that he continues to do so, especially with what many Lebanese (of all religious creed) see as the hijacking of Lebanese politics by the Shiite group Hizbullah and its charismatic leader Sheikh Hassan Nasrullah. No mention of Hizbullah or Nasrullah by name was made by Sheikh Amin, but it was clear to everyone in the audience who he was referring to. “There is no permission for a religious leader to get involved in politics,” said the sheikh. “I remember from my Najaf school days that Sheikh Ansari was one of the pillars who defended the notion of scholars not having political ambitions whatsoever,” concluded the Shiite leader. He also spoke about the Welayat al-Fakeeh notion, or a nation ruled by religious scholars, an obvious reference to Iran after the 1979 revolution, and how he was opposed to this.